State nickname is the Bluegrass State. Interesting that the state bird of Ohio and several other states is the cardinal also. You would think that there are enough different kinds of birds that this wouldn’t need to be true! I noticed that also, Bill. I should take a look and see just how many states use the cardinal. Let’s face it, they are probably eight out of ten people’s favorite bird… No wonder they are so popular as holiday ornaments. Interesting I’ll look forward to reading some of the Kentucky based writers on the site. Course it would, in a show of pride for my state to see some authors from South Carolina. Hi! Love this site! And being from KY, I’m very happy to see the Ky. cozy book list! PS.. I’m surprised that you are not on Facebook..or did I miss it? Welcome to the site, Virginia. I’m glad you found us! No, I’m not on Facebook. I already spend way too much time at my computer. I am sure that if I was, I would pretty much be attached to my computer chair! Sue Grafton based one of her books in Kentucky…don’t remember which one. She’s from Louisville originally. You may not be on FB but thats how I found you…..
I’m glad you found the site through Facebook, Holly. Welcome! When my family and I lived in Texas and we were driving through Arkansas on our way to Kentucky (have I lost you yet? ), we heard people debating on whether the capital of Kentucky was pronounced Lewis-vill or Loo-eee-vill. 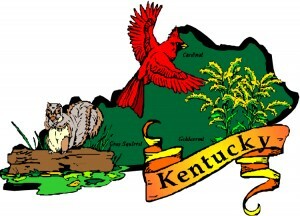 I wanted to say, first of all that the capital of Kentucky is Frankfort, and secondly, it’s pronounced “LOO-uh-vull”. :p LOVE your blog!